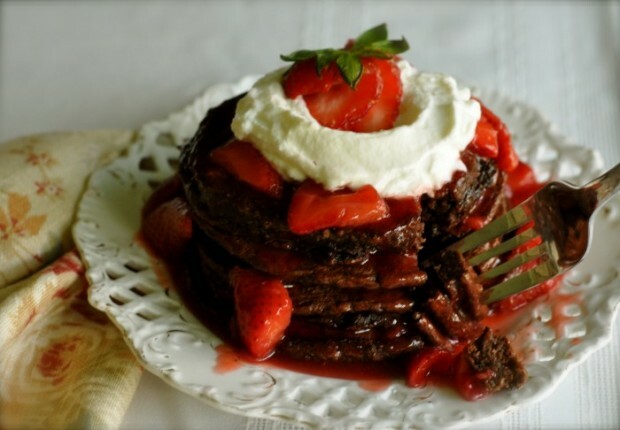 Mother’s Day is this Sunday, and what mom wouldn’t be thrilled to have Double-Chocolate Chip Pancakes oozing with Strawberry Syrup served to her. Decadent? You bet. Healthy? You can check off that category, too. For this is, indeed, a super-food recipe for super-moms; the ingredient list is chocked full of such nutrient rich, power-house fare, mom might be up for a hike in The Arb after breakfast. Mindo Chocolate Makers are located in Dexter. I love the idea of chocolate chip pancakes, especially loving the idea of having them served to me in bed. But I also appreciate not feeling weighted down first thing in the morning, and fitting into my jeans. 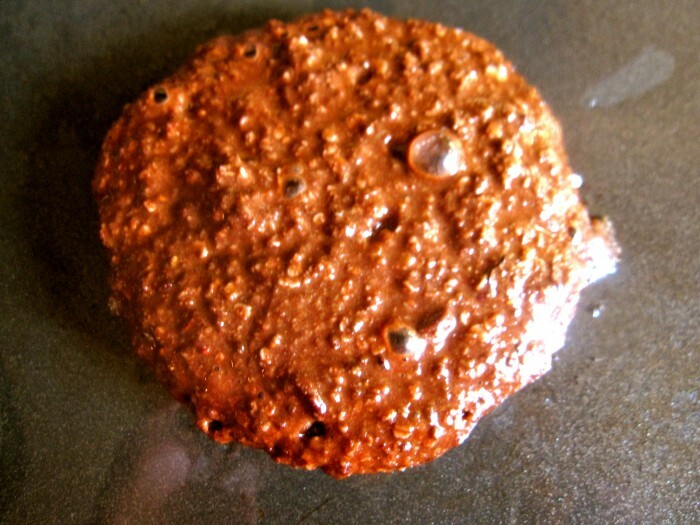 After googling healthy pancake recipes to death, I stumbled upon a recipe from the web site, Cravings Gone Clean.com, that looked intriguing – certainly worth a spin around my kitchen. And indeed it was. It begins with gluten-free quinoa flakes, which I used in place of flour. Quinoa has been a staple in my diet for years; I love the poppy texture and protein-rich health properties. But I’ve never tried quinoa flakes, which – according to Ancient Harvest web site – is quinoa steam-rolled into a quinoa flake. Quinoa flakes are often used as a substitute for flour when baking. Add liquid to desired consistency; you may want to make a “test cake” before adding all of the liquid. The original recipe included a peanut butter syrup, but with strawberries coming in season, I couldn’t resist making a honey-berry based one, and raw, unfiltered honey has strong antioxidants. Also, some believe that the pollen in honey works as a vaccination, building immunities to allergies. I’m a believer; honey has helped my allergies. But here’s the catch; it’s important to purchase honey as close to where you live as possible. It wouldn’t help your symptoms if you ate honey with spores of flowers from Tacoma, for instance, if you suffers from allergies in Ann Arbor. I purchased my honey (Bee Sweet & Healthy, produced in Jackson), indeed all of the ingredients for this recipe, from Arbor Farms. The Farmers Market and People’s Coop sell local honey, as well. The batter was a tad bitter for my palate, so I added organic sugar. But keep it sugar-free if you prefer; you may find the syrup is all you need to sweeten up the pancakes. When small bubbles appear, the cakes are ready to flip. There are other goodies in the recipe. 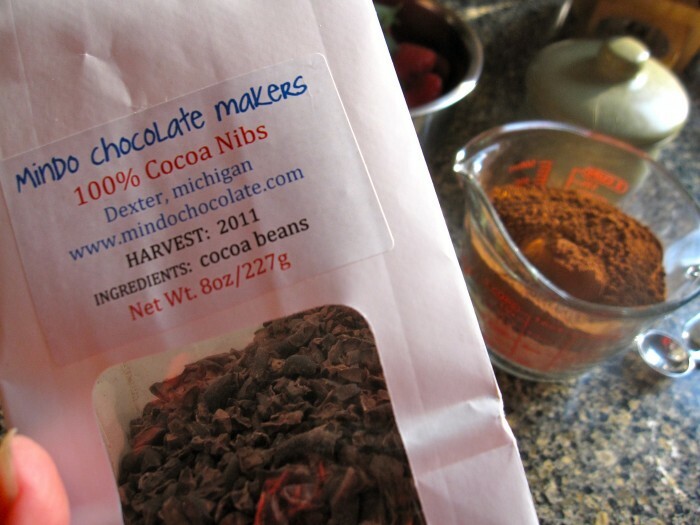 According to the Cleveland Clinic web site, cocoa bean is rich in flavonoids, a class of plant nutrients. Therefore, dark chocolate and cocoa may protect your cardiovascular system, but over-processing cancels out the nutritious benefits. Chia seeds are a great source or fiber and Omega-3’s, and easily incorporated into a variety of recipes. Refined coconut oil has no hydrogenated fat and it’s neutral flavor is perfect for baking. Since I was making a mess anyway, I doubled the batch and froze the extras. I’ve been reheating them in the toaster oven all week for quick pick-me-ups, and the accompanying strawberry syrup is better than ever after a weeks confinement in the frige. Who said mom can’t have her cake and eat it too? If you make these pancakes you will be nurturing her soul as well as her health. Happy Mother’s Day! Make Strawberry Syrup, recipe follows. In a bowl or large measuring cup, whisk together yogurt, egg whites and milk. In another large bowl, combine quinoa flakes, chia seeds or flax meal, baking powder, cocoa powder, cocao nibs and chocolate chips. Heat 1 tablespoon oil over medium heat in a griddle or sauté pan. 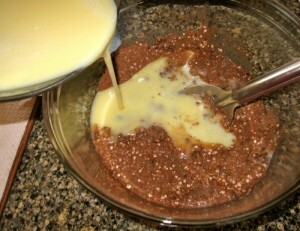 In batches, pour or scoop batter into oil to desired pancake sizes and let cook until small bubbles begin to form on cake. With a spatula, carefully flip cake and continue cooking another minute until cooked through. Place on lined sheet pan or oven-safe dish, and put in oven to keep warm. Finish the batch, adding more oil as needed. Serve with syrup and a dollop of yogurt. *I used cocoa nibs made in Dexter, which provide great texture. May substitute with additional chocolate chips, if desired. Whisk corn starch into lemon and orange juices, and let sit a couple of minutes. More Recipes Filed Under "Other breakfast & brunch"